You need a line array pro-touring PA cabinet that will handle the largest venues. It has to run ±3dB from 80Hz to 12kHz with 108dB/watt average sensitivity. It must have 135dB output capability. It can't weigh more than 100 pounds. It can't be more than 12 cubic feet in volume. And it has to cost less than $2,000. Seems a simple enough task. There must be lots of speakers with those specs, right? Wrong. You can't buy a speaker that meets all of those requirements. But you can build one. It's the DR300, which offers a combination of efficiency, bandwidth, output capability, size, weight and versatility that is simply not available from any manufacturer at any price. "I have been using a pair of DR300s for about 5 months now on large and small gigs. Its a very clean and powerful cabinet. I have used all kind of cabinets over the last 30 years and it will hold its own with the best!" The DR300 at 30x24x28 inches is about the same volume, but less than half the weight, of the benchmark line-array speaker, the EAW KF760. 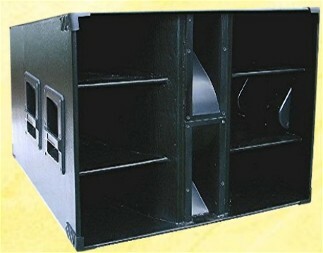 Its long term low-frequency output capability of 135dB is 7dB higher than that of the KF760, yet it only needs an 800 watt amp, whereas the EAW needs 2000 watts. The DR300 is a two way system, so you can run with two power amps instead of the three that the EAW requires. The DR300 can even be run with a passive crossover if you don't have a rack full of amps and active crossovers. The EAW can't. If you want to buy an EAW KF760 plan on spending about $5900. Each. Depending on your choice of drivers you can build a DR300 for as little as $600. If woodworking isn't your thing you can have one custom built for you by one of our Builders for as little as $1599. DR300s are narrow dispersion long throw cabinets and are not recommended for use when the minimum speaker to audience distance is less than thirty feet, nor for venues with less than 800 seats. Plans are $ 14.95, delivered within 24 hours as email attachment in MS Word format. 25 pages, 30 photos, 15 diagrams. PDF version available on request.